This story is about a new smaller icd and it's advantages. Cameron Health has one that goes in your side and is wireless....no leads in your heart. I tried to get in the clinical trial that's going on now but you need really good insurance. This looks good John, it is about 2mm thinner than the Boston Scientific Cognis that I am due for, which was the thinnest up to date, so will make inquiries with my ep. It is available in Australia too. I really hate the thickness of my device at the moment, which looks like I am hiding a packet of cigarettes under my skin. Anything that will lessen this will be fantastic. Just hope my leads are compatible. Thanks for the article John, looks very interesting , Brooke, I have read about that unit that you are talking about. I believe that Washington State University has a trial going on it, but being with the VA i don't qualify to try it. Both devices also have features designed to reduce inappropriate or unnecessary defibrillation therapy, while ensuring effective therapy occurs when the patient needs it. 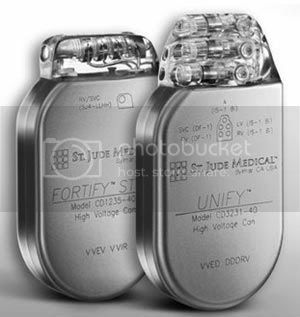 The features include advanced sensing technology and more anti-tachycardia pacing options, which can convert many fast ventricular arrhythmias painlessly and avoid the need for high voltage shocks. Thanks for the information. I don't think I will need a replacement for many years. By then they will be so small and do so much more than now that we can't imagine. Start your cars, call ahead to the doctors office and send them x-rays and ekg's. Prescribe medicines and change TV channels even download movies. Who knows?